CENEOH Haiti (Centre for Neohumanist Education) has launched several new programs targeting both students and surrounding community in Port-au-Prince. USAID has funded the completion of a computer hall with 12 new computers, a fast speed Internet connection, and printing and Xerox services, offering computer certification classes and Internet access. The demand has been great, and all classes have already filled up. Especially excited are the students and teachers, who are now able to access the virtual library for class assignments and information. The Haitian Karate Association has chosen the CENEOH campus as its national training and demonstration site. An amphitheatre stage has been built to accommodate planned performances. Karate, yoga, and dance continue to take a significant part of the school curriculum. A well-known local artist has also joined the teaching staff, offering classes in drawing, sculpture, painting, calligraphy, and traditional crafts. Several studios have been added for the new school year, and a beautiful new meditation and yoga studio provides a space for classes and meditation sessions. Thanks to a $300,000 grant by USAID AMURT-Haiti has continued to expand the educational focus of its development activities. It renovated a community school in the Northwest of Haiti, paying for salaries, uniforms, and other expenses. The opening of the school was celebrated with a grand cultural event by the village. AMURT has started a system of Environmental Education Seminars for teachers, and has expanded its canteen and nutrition program to include the training of community school health and nutrition agents. AMURT’s Northwest staff has grown to include 6 agronomists, 3 engineers, and 8 teachers. 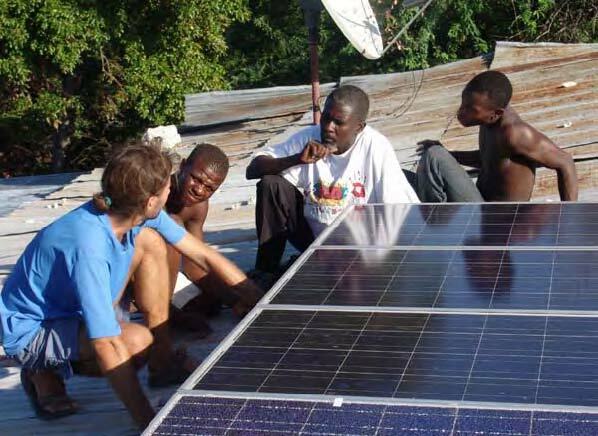 A solar ovens assembly and demonstration plant, and a factory/demonstration site for bio-sand water filtration systems give full-time employment to 21 local people, and offer classes and training to schools and community members. The first environmental demonstration site has been established in the village of Tite Place , with a fruit tree nursery and sustainable bio-intensive agriculture complex. By December local schools’ pupils will begin planting the first of 50,000 mango and avocado trees along mountain slopes and ravines to help stabilize the soil and raise the water table. The objective is to define community managed fruit forests and green belts. The initiative has received a wide praise by USAID, which has become interested in AMURT’s blending of environmental education and community development. The agency has committed to supporting an expansion of the activities for the next calendar year. The Ananda Marga Preschool Bello Despertar (Beautiful Awakening) in Guatemala was started by ERAWS in 1989 in Limonada, one of the poorest areas in the capital. This year 100 children ranging from 3-7 years old started in January in the two classrooms. Now in October, 76 of them are completing the school year. Since preschools are not obligatory they are highly undervalued and few in Guatemala . The result is that many children in start first grade at the age of seven without any preparation. The difficulty in adjusting to the environment has led to many children leaving their education without even completing first grade. That is also why we have kept the emphasis on the importance of the preschool. We ask for a contribution of 15 Quetzales (US$2), although everybody doesn’t pay. Since it’s not enough to cover the costs the local members of Ananda Marga contribute towards the salaries of the teachers and the materials. This year for the first time electricity was installed in the building. Often the toilet is broken, the roof leaking, and the windows smashed. But the Ananda Marga Preschool continues to be popular among the community, because children having gone here are the best in their class when they get to primary school. The Progressive Kindergarten and Preschool had its first day this September. Jyotsna Henry has started this new school initiative with 2 students, but hopes to expand to 7 as soon as she receives the daycare license she has applied for. Jyotsna is also a NHE Diploma Program student and hopes to grow this small school to a full NHE elementary school.